LAS VEGAS — Morphy Auctions offered a collection of antique Colt firearms on September 20. The one-day auction featured the Feldman collection, including firearms connoisseur Dr Edward Feldman’s collection of the nation’s most desirable Colts, ranging from Paterson to Model 1911. 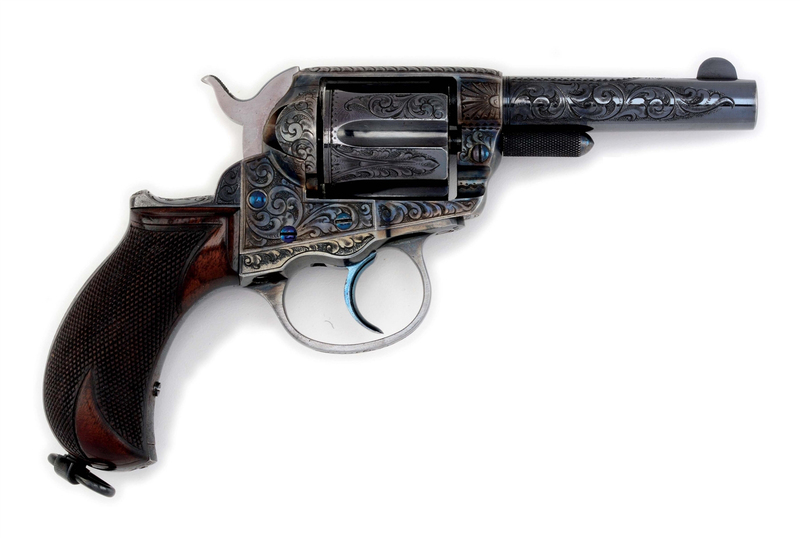 Topping the sale was a factory-engraved 1886 blue and case colored Colt Lightning, which blasted through its $70/90,000 estimate to finish at $190,650, including premium. The spectacular panel scene Colt Lightning has the desirable Sheriff’s Model configuration, the barrel engraved and the firearm retaining nearly all of its original factory high polish blue finish with what the auction house described as “the most perfect ‘COLT DA 38’ panel we have seen.” With an engraved bighorn sheep in the panel at top of the grip strap, the gun had been featured on the cover of the Las Vegas Arms Show program for years and came with not only a factory letter, but also a letter from Herbert G. Houze detailing provenance. It was once owned by Senator Peter McLaren of Perth, Ontario.